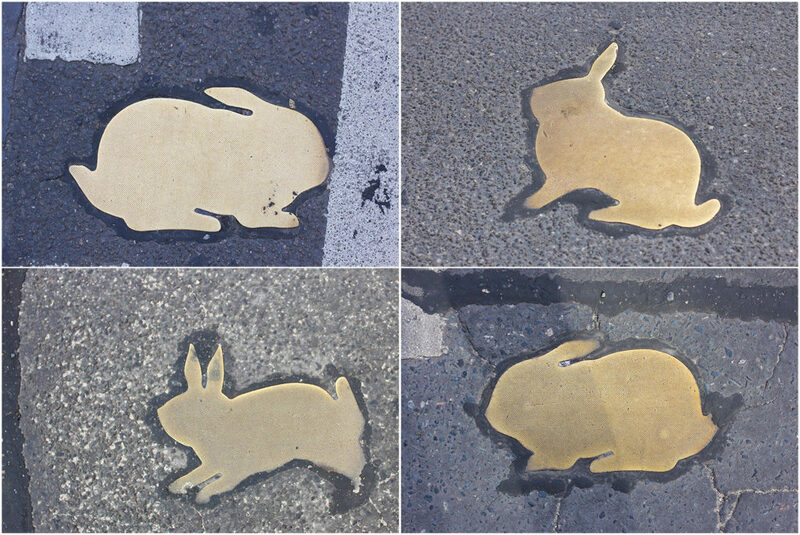 The brass rabbits of Karla Sachse’s Kaninchenfeld (Rabbit Field) add a touch of colour and some much needed shine to an otherwise unremarkable stretch of the Chausseestraße in Berlin. 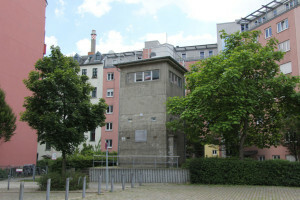 The Kaninchenfeld is one of seven artworks selected from a host of competition entries to mark the locations of Cold War Berlin’s inner city border crossing points. 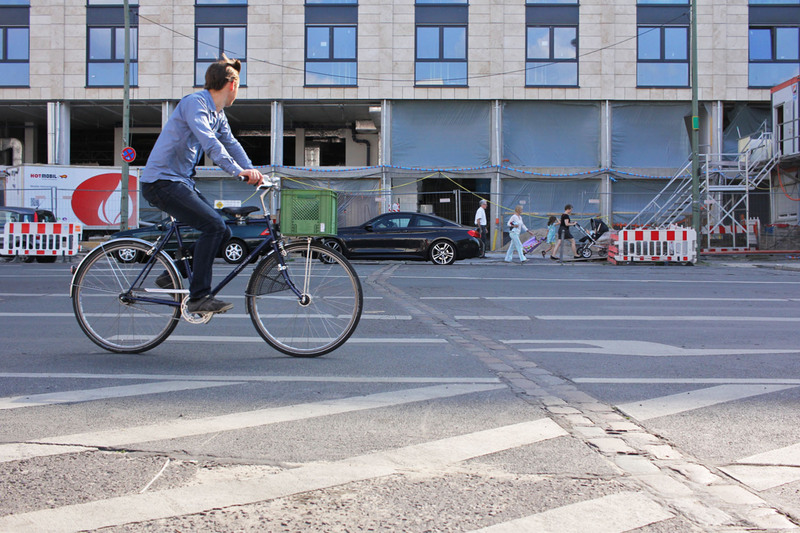 The crossing at the corner of Chaussestraße and Liesenstraße was used by West Berliners and East German citizens wanting to pass between Wedding in the West and Mitte in the East. 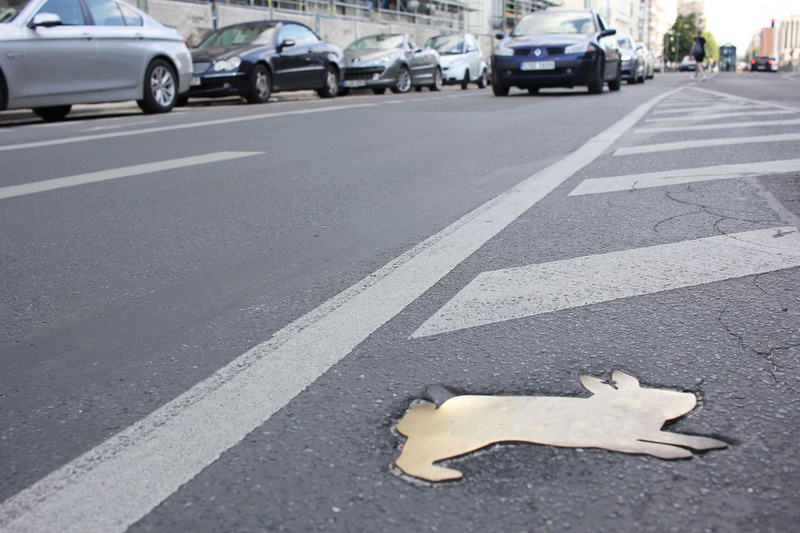 In 1999, Berlin artist Karla Sachse placed 120 brass rabbits here, sunk into the asphalt of the road and slabs of the pavement on either side of it. Between 1961 and 1989 a thriving rabbit population made their home on the death strip, the no-man’s land between the inner and outer border walls in Berlin. 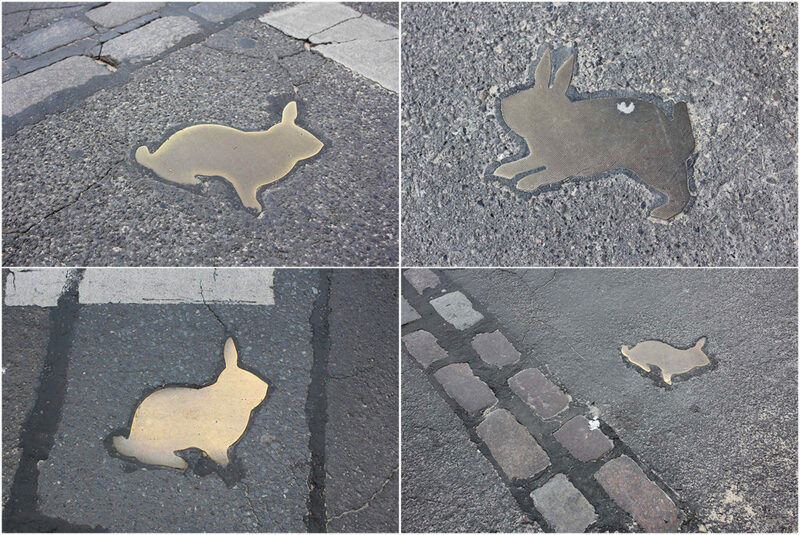 Unimpeded by the travel restrictions affecting their human neighbours, the rabbits hopped from East Berlin to West Berlin and vice versa. They even openly built tunnels. 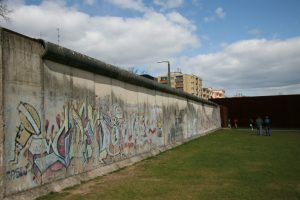 Berliners on both sides of the wall looked on the rabbits fondly. Unsurprising, given their lack of respect for or fear of the border guards and the dictates of the communist regime. Sadly for the rabbits, the end of the Cold War also spelled the end of their utopian existence on the death strip. The walls came down and foundations were laid where previously only their warrens broke the surface. 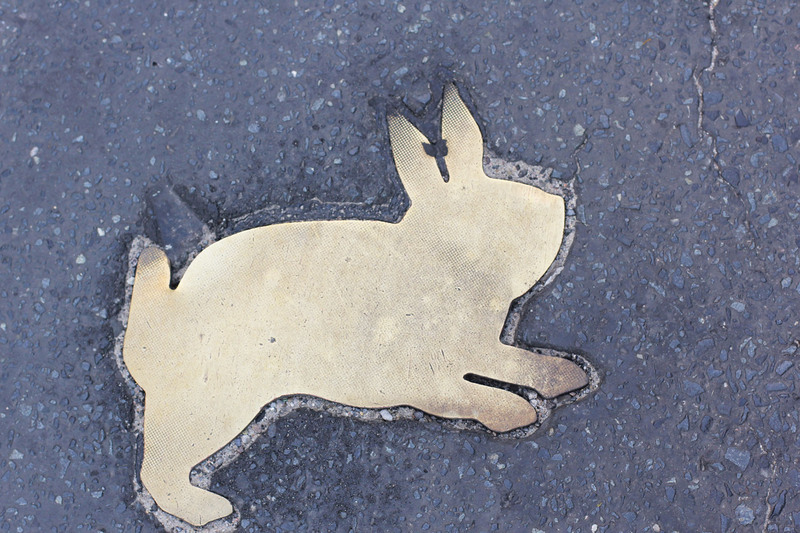 As if that wasn’t enough, even the brass rabbits that moved in later haven’t been allowed to live there peacefully. 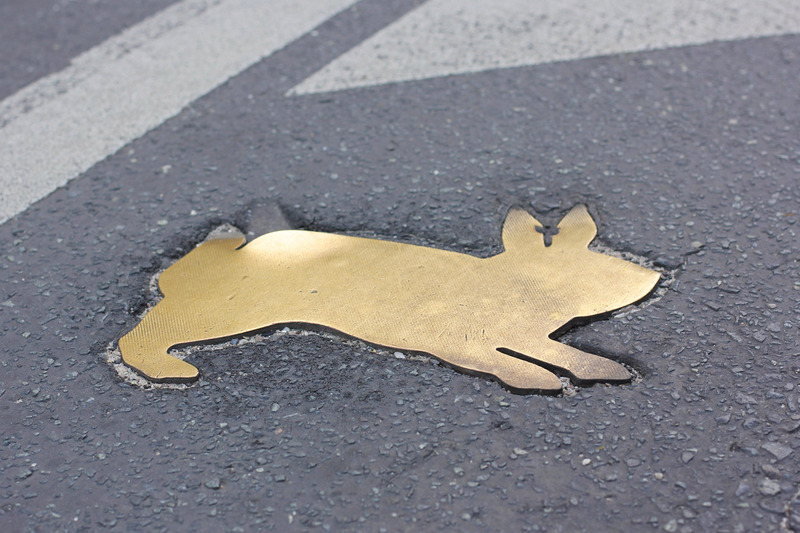 The brass rabbit population has also been affected – several of their number have been lost, victims of building works, the renewal of the road surface and replacement of pavement slabs, others are missing tails, ears or legs. Of the 120 originally laid here in 1999, I counted just 44 on my visit in 2016. 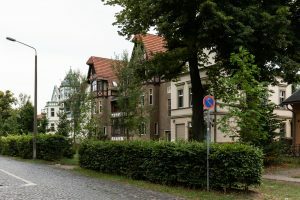 Several may have been hidden though by the cars parked on either side of the road and construction sites for the Merika Hotel and The Garden Living apartments. 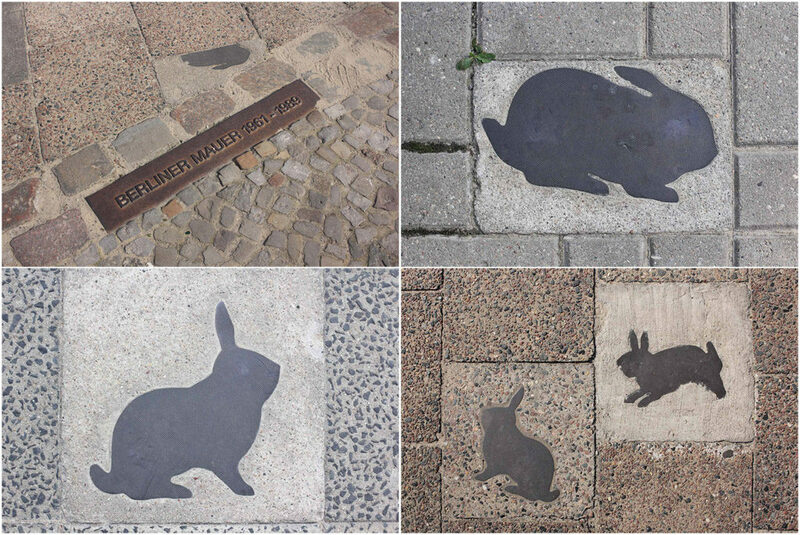 I was a little surprised that there is no information at the Kaninchenfeld about the rabbits and the artwork created in their memory – there were originally two boards here, which I can only hope will reappear when the buildings around them are completed. For now, if you’re going to hunt the rabbits look for the double line of bricks marking the former route of the Berlin wall at the corner of Chaussestraße and Liesenstraße and cast your eyes about you. 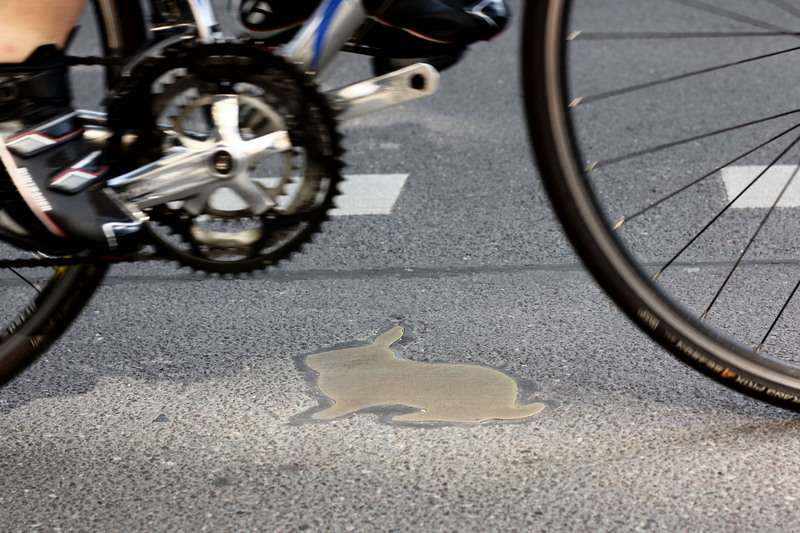 The rabbits on the road are easier to spot as they have been polished to a shine by the tires of the cars that regularly run them over. The Kaninchenfeld stretches from here to the corner of Wöhlerstraße. The rabbits of the Berlin Kaninchenfeld being rabbits, there’s always a chance that they’ll multiply but unfortunately it seems more likely, that like their real-life counterparts before them, the destruction of their habitat will see them leave the area so you should visit them while you can.